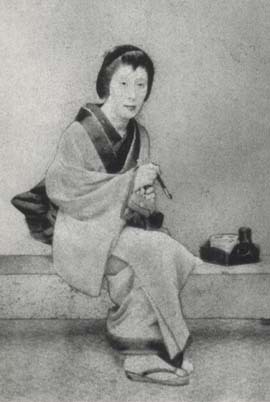 1859: born in Ôsaka in the district of Kuzaemon-chô. 1866: he starts his career as a disciple of the actor Nakamura Tsurusuke V, the son of Nakamura Shikan III. He plays under the name of Nakamura Umetarô in a troupe of children-actors (kodomo shibai). 1st lunar month of 1872: Umetarô plays at the Tenma no Shibai (Ôsaka) the role of the courtesan Yûgiri in the drama "Kuruwa Bunshô"; the role of Yûgiri's lover Fujiya Izaemon is played by Kataoka Hidetarô. 7th lunar month of 1872: Umetarô plays at the Mitama no Shibai (Ôsaka) the role of Somenoi in the drama "Tengajaya-mura". September 1885: Umetarô and Nakamura Shikaku I go together to Tôkyô and join the Torikuma Shibai troupe at the Harukiza. September 1885: Umetarô plays at the Harukiza in the drama "Ogasawara Shorei no Oku no Te". June 1890: Umetarô plays at the Harukiza in the drama "Yoshitsune Senbon Zakura". The theater is suddenly burnt to ashes by a fire the 23rd of this month. December 1891: Nakamura Umetarô takes the name of Nakamura Tomijûrô III at the newly-rebuilt Harukiza. This prestigious name has not been held since 2nd lunar month of 1855. The new Tomijûrô plays the role of Tokiwa Gozen in the drama "Fushimi no Tokiwa". His stage partners are Ichikawa Ennosuke I, Ichikawa Yaozô VII, Nakamura Shikaku I, Nakamura Komanosuke VI, Azuma Tôzô VI, Nakamura Kangorô XII and Ichikawa Utasaku. October 1894: Tomijûrô plays at the Harukiza the difficult role of Sodehagi in the drama "Ôshû Adachi-ga-Hara". His stage partners are Ichikawa Kuzô III (Sadatô), Ichikawa Yaozô VII (Munetô) and Ichikawa Kien (Yoshiie). August 1897: tour in Kanazawa with Ichikawa Danzô VII; Tomijûrô plays the roles of Shizuka Gozen and Suke-no-Tsubone in the classic "Yoshitsune Senbon Zakura", which is staged at the Inariza. January 1901: Tomijûrô appears on stage for the last time, at the Ichimuraza, where he plays in the drama "Miyo no Haru Sumô no Haregi". Nakamura Tomijûrô III was an onnagata actor, who was trained in Kamigata and spent his best years in Tôkyô at the Harukiza. He was too tall for many onnagata roles and had to specialize in warriors' spouses roles in jidaimono. As far as art is concerned, he made no original contribution and did not perform the role of the shirabyôshi Hanako in the dance "Musume Dôjôji", the emblematic role of the Nakamura Tomijûrô line of actors.